We've all heard of Murphy's Law, which is usually stated thusly:"If anything can go wrong, it will." This is followed usually by Murphy's First Corollary: "Left to themselves, things tend to go from bad to worse." Which then leads to Murphy's Second Corollary: "It is impossible to make anything foolproof because fools are so ingenious." This often references Murphy's Constant: "Matter will be damaged in direct proportion to its value." Leading lastly to O'Toole's Commentary: "Murphy was an optimist." And you may have read or heard of other rules. There's the classic (and one presumes ancient) The Golden Rule: "He who has the gold, makes the rules" and the obtuse Vique's Law: "A man without religion is like a fish without a bicycle." Let's add to this list, with Mark's Law of Beer. It is very simple, and in a couple of lines summarizes the entire craft and mass market beer drinking scene, from brewers to drinkers. It offends no one. Some "award-winning" beers may not necessarily be good. And some good beers may not necessarily be "award-winning." After I received a sweet bottle of Infinite Sadness that was apparently damaged in transit by the U.S. Post Office (causing me infinite sadness, but to be fair to them, it was a blizzard). I did manage to recover a taste from inside the bubble wrap anyway. I thought I'd share my knowledge on packing beers for shipping. So far "batting 1,000" across the US, as well as UK, Netherlands and Taiwan. Let me say first off the bat that in the US anyway, the policy is the US Postal Service will not ship beer, and UPS will ship it if only you have a special permit. That is how I get my beer from Beer of the Month Club (BOTMC). Actually it's more easy technically to receive beer in the US from outside the US. Regarding US regulations anyway, if you import or transport beer for personal consumption, there's no issue with that, and the only potential issue is the tax in your state. That and idiots like those at DHL. To digress, here's a short story about someone who wanted to ship a bottle of Armageddon beer to me as a birthday present, from England. We researched all the rules and regulations about shipping and receiving and taxes. And to summarize, is 100% legal to ship bottled beer out to the US from the UK, using a carrier like DHL. DHL can transport beer, and it is 100% legal to receive beer in the US, for personal consumption, without an importation license. And as it is for personal consumption, no Federal tax is due. I even as far as to check the Massachusetts tax commission for liquor (as it was going to a MA address). They seemed almost perturbed when I called to ask about the duty on a single bottle of beer. They, not surprisingly, said no tax needed, thank you for calling. So imagine my surprise when DHL would not release the beer; again this was 1 bottle of beer. When I spoke to DHL, I was told I did not have a beer import license. I stated it is not required by US Federal law, and the DHL person did not understand. So I was transferred from a lower drone to higher-level drone to supervising drone (I believe the supervisory-level drones do have the ability to reproduce). I was made aware that DHL has a double secret, unpublished secret policy (did I mention it's secret) about not releasing beer shipments of any quantity unless the recipient has an import license. The reason I was told - and I swear I can't make this up - is this "proves the recipient is of legal drinking age." As if someone under-aged would spend 40 Pounds to get a bottle of beer from the UK shipped to the US, so they could drink it a week later. I did offer to come to the Boston area DHL office and show my passport, or drivers license, or birth certificate, or let them count the rings around my eyes to prove my age, but that did not work. Fortunately, the person who shipped it filled out all the proper import/tariff code information (parenthetically, there are international tariff codes for everything, which defines the import tax). If DHL had read the description and code, and seen it was beer, they should have refused to transport without confirming the recipient had an import license. Maybe DHL's policy is so secret, the folks in the UK don't know about it? In the end, DHL had to refund the shipping fees. I did get the beer a few months later in England; I over there in a business trip. Ironically, it wasn't that good. Anyway back to shipping beer. As we have seen, apparently one state doesn't care about the miniscule tax on a bottle (maybe 2-3 bottles?) so let's just assume all states don't. What other issues are there from real world standpoint? Beers are not a dangerous good to ship, meaning it is not flammable nor corrosive nor toxic as defined by US DOT or IATA. Therefore it can be shipped, and here's how to do it. The first thing is get a sturdy box; you should have a box at least 2 inches deeper than the largest diameter of the bottle you shipping. The box should also be at least 3 inches longer than the longest bottle you will be shipping. The size of the box also depends on how sturdy it is. If it's really thick cardboard, you're fine with these minimum dimensions. If it's kind of flimsy cardboard, you may need it to be larger to increase the "crush space." So for example, a large bottle of Bear Republic Racer X, is 11.5" tall by 3" in diameter. Therefore the appropriate box would be at least 14.5 inches tall (11.5 + 3) and 5 inches deep (3 + 2). The second thing you need is Ziploc bags. Gallon size freezer Ziploc bags are absolutely the best thing to put beer in, whether it's cramming it in a suitcase when you're traveling, or shipping it. Cans, bottles, half-growlers all fit. Also note that larger bottles, like a caged bottle of Two Roads Workers Stomp, will fit. You just have to stretch the bag around the bottom of the bottle and the zipper will close. This type of containment is very important for smaller bottles and certainly cans as well. I just put each one in a Ziploc bag, seal it and roll it up nice and tight. A caged bottle seal is quite durable. However, a larger bottle with just a cap has the potential to have more CO2 dissolved in the beer and can be problematic, as I have seen. What I usually do is wrap the end very tightly in saran wrap, followed by packing tape to hold the seal tight, so hopefully so there's no loss. Keep in mind these boxes don't always travel at sea level. If they go in the cargo hold of an airplane, that box will be subjected to much less atmospheric pressure, which means the bottle's inside pressure has an even greater chance of popping a cap off. What else I like to do, is wrap each bottle with bubble wrap. I use the thin sheets of bubble wrap that are pre-perforated, and I wrap the bottles on a diagonal. This is so when you're done, you tape it sealed and fold/tape the ends over, to protect each end of the bottle or can. The cans or bottles are put in the box with padding underneath and on the top. This can be foam, Styrofoam peanuts, or shredded paper. Some good things to use are the "air bubbles" that come from Amazon; the large ones are great bits of packing material to re-use. Also the boxes from BOTMS are super for 750 ml bottles. I like to use folded cardboard at the ends of each beer bottle/can sometimes, as well is in-between the bottles. This pretty much guarantees that unless the box is drop-kicked off a six-foot loading dock, the contents should be okay. Just so you know, most commercial shippers' standard is your package must survive a 6 foot drop onto a hard surface. The box should be sealed securely with proper packing tape; I usually go over other seems just make sure everything is tight. In this way everything is packed securely, and this also means if a bottle does leak, it probably will not wet the packaging and alert the carrier that you are shipping beer. The address labels are also important; put them on at least two sides of the center of the box, and cover them with clear plastic packing tape. That way the label will not become smeared, defaced, nor easily peeled off. One of the best deals in shipping inside the US is Priority Mail - if it fits in the box, it's a certain fixed price (I've always wanted to pack some Lead ingots and see if I can ship 230 pounds for $5.95). There's also the question what to do when you're shipping outside the US? Well, again the concept is De Minimis Non Curat Lex: the law does not concern itself with trifles. I really don't think anyone cares deep down if a bottle or two of beer goes to another country. However to avoid problems here's what I do. I will usually include some small gifts, like Yankee candles or something else, maybe Patriots T-shirt or other memorabilia (did you know they won the Super Bowl 2015?). You should put on the customs form "gift." Describe it as whatever the item is, plus "olive oil." That way if the beer is wrapped in bubble wrap at the bottom of the box, if Customs at the receiving country opens it, they probably won't even inspect the bottle. That way your beer can even get to Taiwan intact. Again, possibly against the law in some countries, but so is cutting the heads off of people; so legislators, pick your priorities. And why is wine so easy to ship? 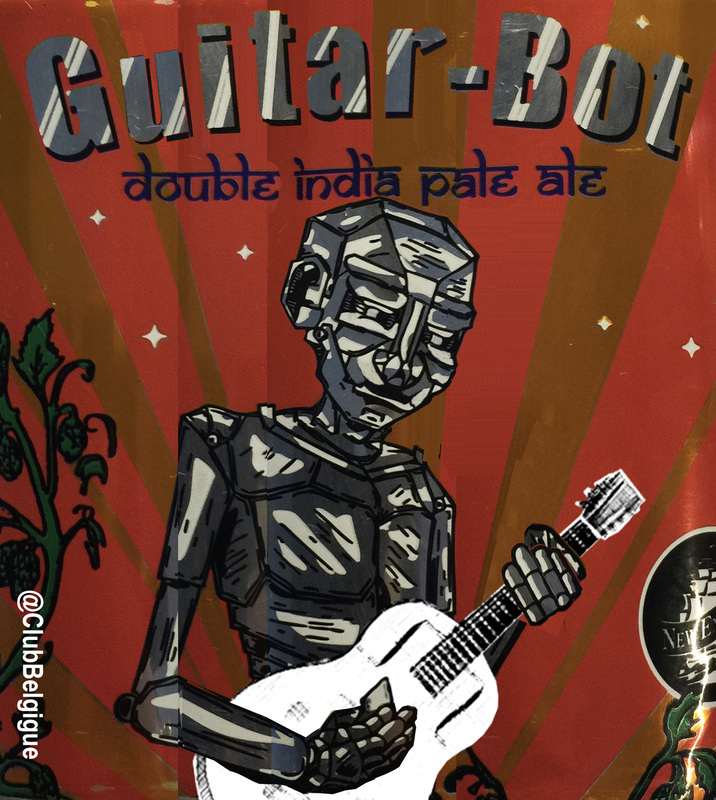 For those that don't know it, there was a lawsuit or threatened lawsuit about the beer "Gandhi-Bot" from New England Brewing. While it is true Gandhi did not drink beer later life, it is believed did not adopt temperance and vegetarianism until he went to England to study. He also married a 14-year-old, so go figure. Anyway - perfect solution is here - I present Guitar-Bot.